Advice on selection cremation jewelry, urn jewelry and ash jewelry. Selecting the right cremation jewelry whether for yourself or as a gift for a friend or family member takes careful consideration. Factoring in things such as personal taste as well as lifestyle and budget can help you choose a keepsake that not only captures your memory but also is easily integrated into your day to day life. You need to start somewhere on your journey to choosing your keepsake and the best place to start, in our opinion, is on the inside. You need to think about what, if anything, is going to be held inside the keepsake. To hold ashes or not. Cremation jewelry is typically designed to hold cremated ashes or another memorial of personal selection inside the keepsake - cremated remains, a few strands of hair, anything that is a personal reminder of the loved one that has passed. But this is not a MUST DO. Some people aren’t comfortable with that option, some circumstances might not allow for you to have a personal memorial for the inside. Before you start your search, know whether or not you will be adding a memorial or have a clear idea if that’s something you may want in the future. This either opens up the door to several hundred different keepsakes or can narrow the scope down significantly. To see ashes or not. Most cremation jewelry keeps the interior memorial private from viewing from the exterior of the keepsake and the design reveals nothing about what is cradled inside. However, there are certain keepsakes where the interior memorial can be viewed from the outside. Some keepsakes hold a little, some hold a little more. 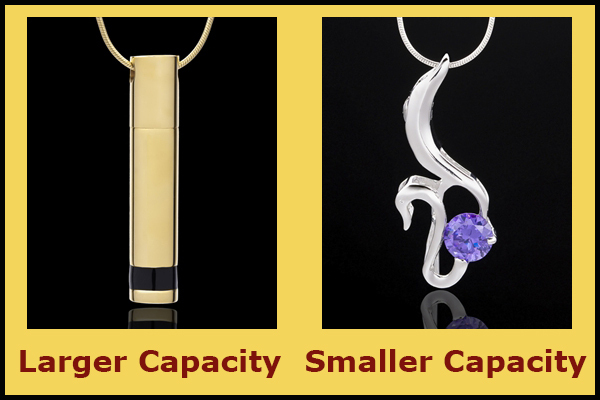 The majority of cremation jewelry will hold approximately 1/8 teaspoon of memorial while some, such as some of the larger cylinders, will hold a little bit more. If you have questions regarding how much ashes a keepsake will hold please contact our customer service at 1-877-723-7229. So you’ve determined where you stand with the interior memorial - great! Now it’s time to figure out your style. Think about likes and dislikes, what appeals to you aesthetically and what is going to work for you on a day to day basis. 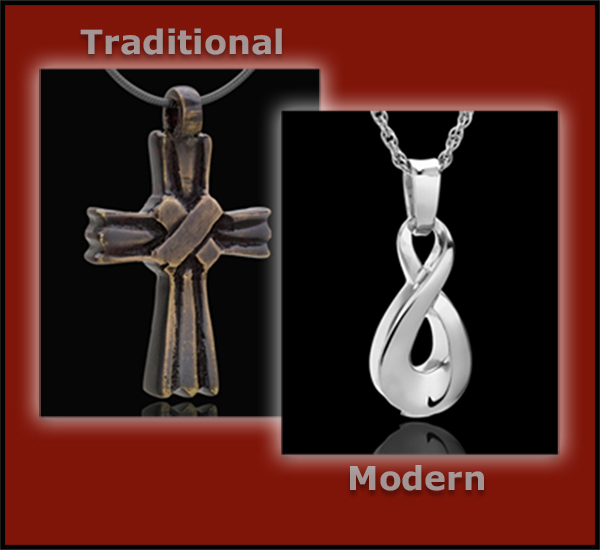 There are both traditional styles of cremation jewelry as well as pieces that take a more modern approach. The traditional style keepsakes tend to be more on the simple side and are typically not embellished or have minimal detailing. Modern styles often have gemstone accents or are more ornamental than traditional styles and are much more decorative. Both traditional and modern keepsakes are available in a wide assortment of themes and materials. Depending on personal preference, your lifestyle and even the type of loss, the style of keepsake you choose can vary. 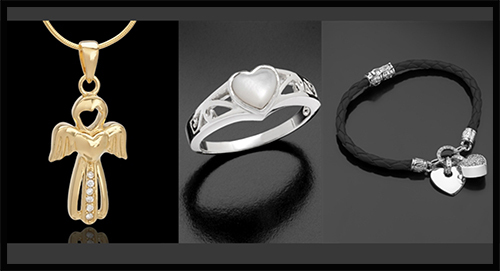 In addition to hundreds of different pendants to select from, cremation jewelry is available as a ring or a bracelet. Bracelets are an option for those that don’t like the feel of a necklace or can’t wear a necklace due to line of work or their activities whereas cremation rings may be worn as a replacement wedding band after the loss of a spouse or as a promise ring or remembrance ring. Like cremation pendants, both cremation rings and cremation bracelets are available in different themes and materials and will hold a memory of a loved one inside an interior compartment that is strategically hidden on the jewelry. So you’ve got all of these different themes, materials, options, ideas. And you like NONE of them. Now what? Then custom cremation jewelry is the way to go. 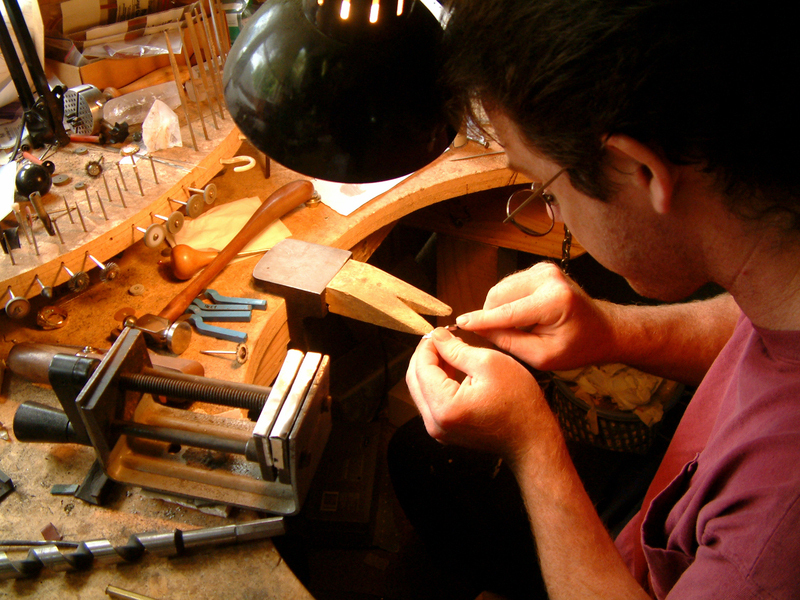 Draft up your idea, talk with our jeweler and create your own custom pendant, ring or bracelet. You approve the final mold and choose the material and we take care of the rest. This allows for a totally unique one of a kind keepsake that comes to life from your idea. You’ve chosen your interior memorial, you have an idea of what type of style you’re looking for and you’re ready to start the journey of choosing the perfect cremation jewelry. We have three ways to help you narrow down your options to help you find the exact keepsake you’re looking for. This is a great idea for those that have a broad idea of what they are looking for but are not sure how to go about getting the end result. Our jewelry finder let’s you search by price, by material, by color and by theme. The finder is a terrific tool for those that are on a budget, families that need to buy several keepsakes and everyone has their own idea of what they are looking for or simply for the person that only wants to look at one specific theme, such as butterflies. Often times, reviews from other people on a service or product can help you make your decision. 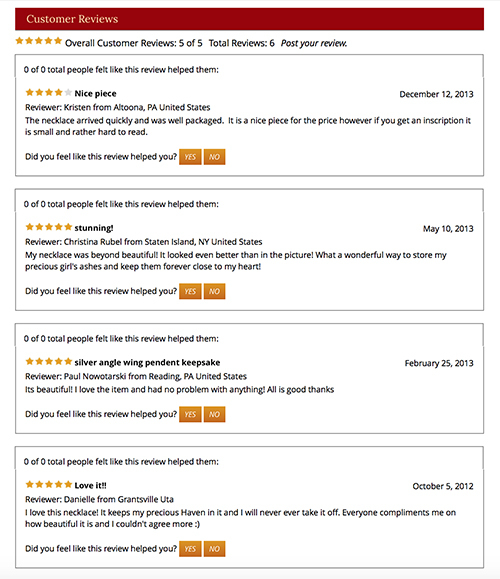 We have thousands of product reviews on many of our keepsakes and you can read from real customers what they loved about their selection and what they didn’t. Each customer’s perspective is a little different just as their loss is a little different and reading about their overall experience can go a long way to reassure you in your keepsake decision. Many have people have metal sensitivities that make wearing certain materials in contact with their skin simply does not work. Maybe you only wear gold jewelry or are a lover of all things silver. Or maybe you aren’t sure which metal you like and want to know more about which metal might work best for you. Take a look at http://www.jewelrykeepsakes.com/Cremation-Jewelry... to not only educate yourself about the metals cremation jewelry is typically crafted from but to also help you make a more informed decision about the pros and cons to each different type of metal. Knowledge is power! We’ve put together a chart that recaps the pros and cons of our three ways that you can narrow down your choices. Gives you four different ways to search for your jewelry. Great option for families looking for multiple pieces or that are budget conscious. Not all keepsakes fall into a specific category. Search may return hundreds of keepsakes and can be overwhelming to find what you’re looking for. Not ideal for those that are looking for something nonspecific. Get real feedback from real customers. 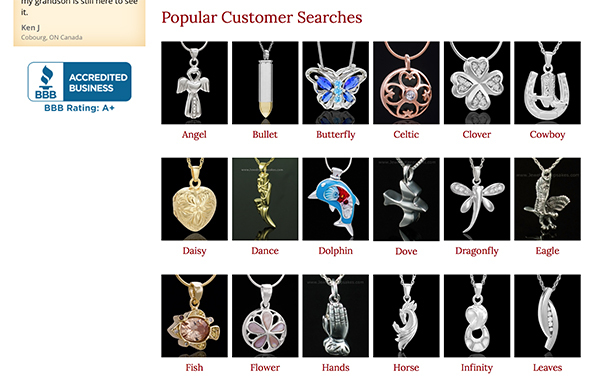 Read what they like and what they didn’t like and about their overall experience shopping with Jewelry Keepsakes. Not every customer’s experience is the same. Sometimes one negative review is not truly indicative of that particular product. Product reviews may be biased toward the reviewer and their individual expectation. Great option for those that only wear one particular type of metal or have skin sensitivity. Can put you into ‘information overload'. For those that have a clear idea of what exactly they are looking for or the theme of keepsake, the type of metal the keepsake is crafted from is often NOT a deal breaker. Have a firm awareness of your budget before you start your search. Factor in not just the cost of the keepsake but also the extras that can quickly add up. Upgraded chains can add anywhere from $20-$30 extra, adding engraved text, shipping and more. Know exactly what your spending limit is and maybe look for a keepsake that is $50 below your budget so that you can add extras if wanted. Are you active? Do you have small children that reach for things? If these situations sound like you, maybe think cremation ring or bracelet. A necklace can easily get snagged when exercising or during rigorous activity or can be challenged by small hands that love to touch shiny ‘interesting’ things. Work outdoors? 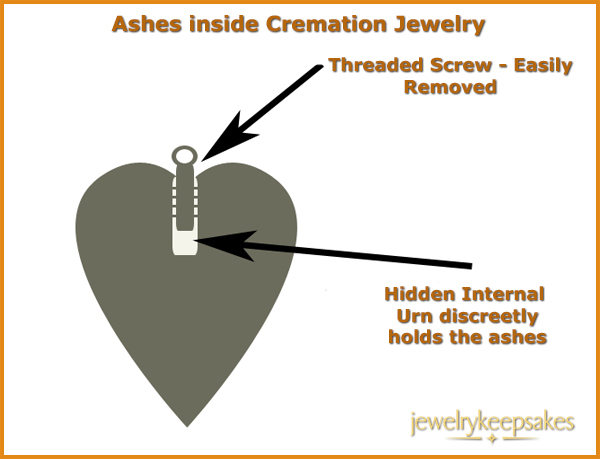 Think keepsake that is easily removed before work such as a cremation pendant with necklace. Go with a longer chain to make it quick to lift over your head. Being aware of your lifestyle will help you select a keepsake that works on a day to day basis and refrain from choosing a style that could get broken or damaged by your activities. If you are in a hurry for your cremation jewelry than a custom piece is NOT for you. Custom cremation jewelry takes anywhere from 2-4 weeks from start to finish as does 14k yellow gold and 14k white gold cremation jewelry. If you need your keepsake next day or two day air, plan on one of our in stock items and order before 12:00 pm noon MST to ship same day. When gifting, keep it simple. 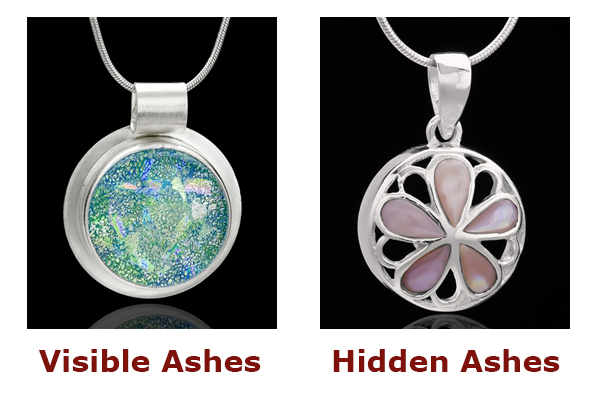 Cremation jewelry makes a great grieving gift for someone that has lost a loved one. When choosing cremation jewelry for a gift, think simple. Choose from one of our more popular items or something that is not personalized. Do not have the keepsake engraved but maybe do a gift certificate in addition to the keepsake for the amount of engraving and include that with your gift. Or upgrade the chain for them to a premium chain. And remember, as a courtesy to our customers, we offer free gift wrapping as well as a gift message upon request. Make sure it stays Returnable. Not that it happens often but there are times when a customer chooses a keepsake and it just does not live up to their expectations. Play it safe and keep your cremation jewelry returnable. 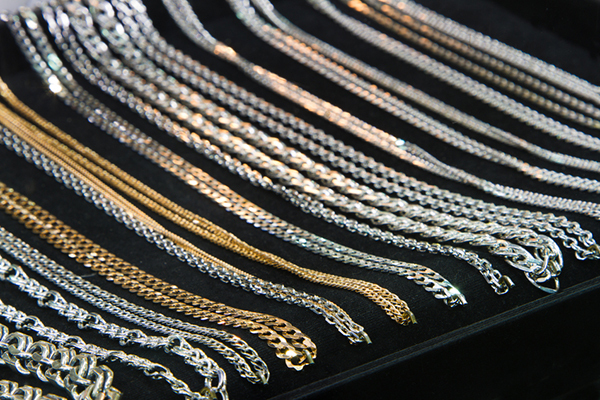 You can always have your keepsake engraved by a local jeweler should you choose. By keeping it simple and waiting to personalize, you keep the door open if the keepsake is not exactly what you wanted and you need to return it. Keychains are a great alternative. Maybe you need to start small. Choose a keychain for your keepsake. Easily attachable to any key ring or purse strap or belt look, they are a personal way to remember a loved one and you don’t have to wear or display the jewelry on your body. Keychains are a great gift idea as well for that someone that has lost a pet or a loved one and you want to get them something but aren’t really sure what. We have been in the business for year and can help you quickly and easily find what you’re looking for. We know our inventory inside and out and will give you our full attention to answering your questions. Give us a call at 1-877-723-7229 or send us an email at sales@jewelrykeepsakes.com and let us assist you in finding exactly what you’re looking for to remember your loved one.